I’d like to think that Aaron and I are not messy people. I feel like we’re disgustingly messy people these days though. I’d like to blame it all on the fact that we’d rather spend our time playing with our daughter when she’s awake, which leaves after bedtime and naptime on the weekends to get basic things like laundry and dishes done – with some possible relaxation thrown in for good measure. And although that is a good chunk of the reason, some of it can be blamed on laziness or impatience. Turns out, Chloe Mae would love to help us clean, it just takes about 5 times as long. Here she is “helping” daddy vacuum. She wanted to push the main part of the vacuum around while he was using the hose – helpful, except Aaron really needed the canister to stay where it was. Aaron thought he had it made when he rigged up our Swiffer and made the handle just her size. She loved it, as long as we were watching her and not doing anything else. 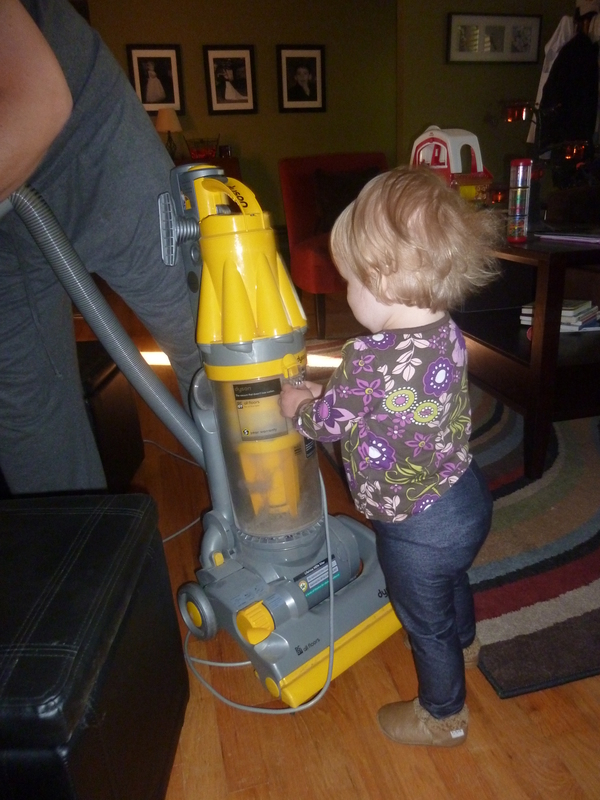 As soon as Aaron went back to vacuuming, she needed to help on that again. I’m thinking someone might be getting their own Swiffer for Christmas this year so we can tag-team it. We did eventually get our entire first floor vacuumed and relatively dog hair free, even so much as moving furniture and really getting everything cleaned. 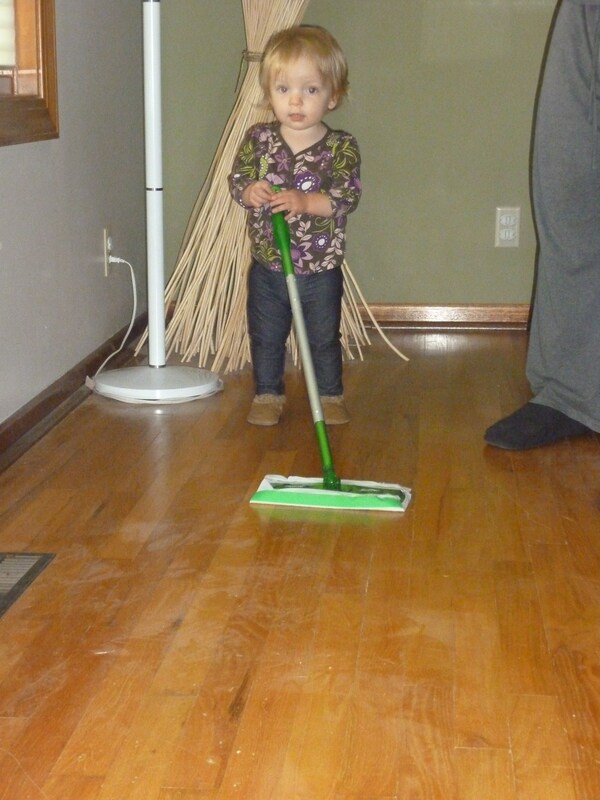 Only a small portion of the floor got mopped – or Swiffered as the case may be – before Chloe lost interest. We’re having people over on Thursday night as part of a progressive dinner through Young Professinals of Ames. I’d really like my floors to be spectacularly clean by then. So, we’ll start the negotiations at a dozen cookies. Anybody willing to come over and mop my floors for a dozen cookies?? We are not as babyproofed as we should be. Chloe took her sweet time starting to crawl, so even though we kept saying “We really need to get everything babyproofed” we were really in no rush. Now that she’s been crawling for a couple weeks, we’re working on getting more of it done, but she’s still not very quick, so neither are we. 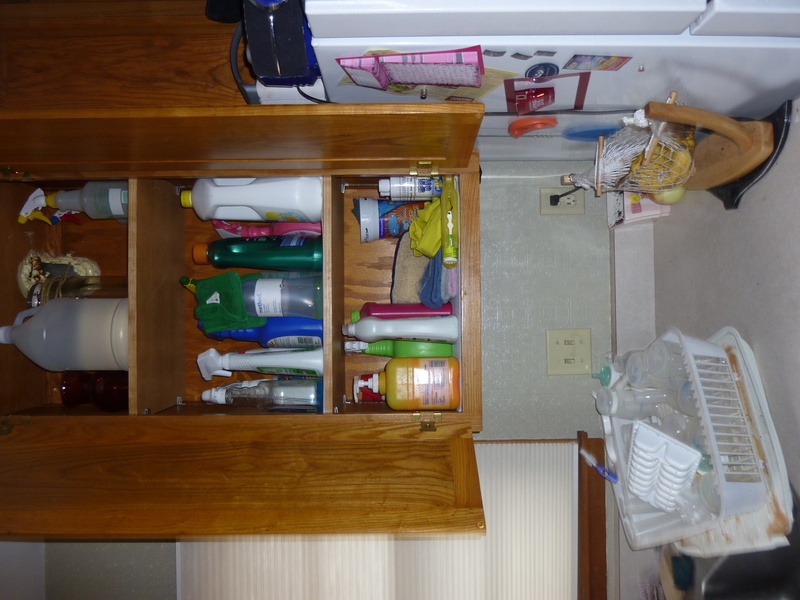 I moved all of our cleaning supplies from under our sink to an upper cabinet. 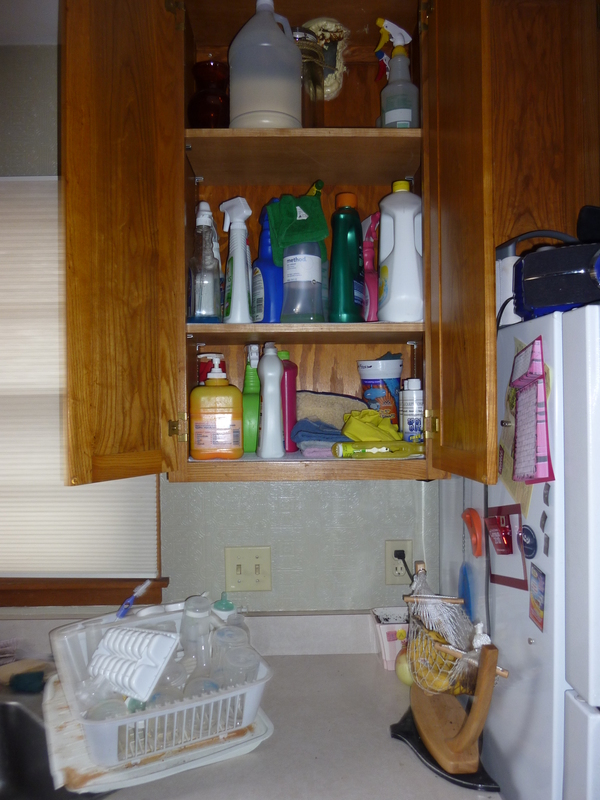 We plan on putting the cabinet/drawer locks on everything in our kitchen and bathroom, but I’m not sure how much I trust them. I trust them enough to keep her out of the drawer that holds our whisk and cheese grater, but if she does manage to get into that drawer, I don’t think a couple minutes with a cheese grater is going to do as much harm as a couple minutes with Windex could. So I just moved all of our cleaning supplies far out of her reach. And I’ll still be putting locks on that cabinet, so a few years from now when she figures out how to crawl up onto the countertops, it’ll take her a while to get into it.